Draft: 2002, Anaheim Angels, 10th rd. Howard Joseph Kendrick III...Graduate of West Nassau (FL) High School...Attended St. Johns River (FL) Community College...Named Conference Player of the Year at SJRCC...Was selected as one of 24 players to represent USA at the 2005 Olympic Qualifying Tournament in Phoenix, AZ...Is married to wife, Jody...They have two sons, Owen and Tyson. Began his 13th Major League season strong before having his season cut short by an achilles injury suffered on May 19...Was hitting .303 with 14 doubles, four homers, 12 RBI, five walks, one stolen base and 17 runs scored in 40 games at the time of the injury... At the time of the injury, ranked tied for third in the National League with 14 doubles...Ranked among NL second baseman in batting average (2nd, .303), slugging percentage (4th, .477) and on-base percentage (5th, .331)...His .324 average vs. RHP ranked sixth in the NL at the time of his injury ...In his last 20 games, hit .347/.382/.528 with seven doubles, two homers, four RBI, three walks, one stolen base and 11 runs scored... Appeared at second base (33 G), left field (6 G) and first base (2 G)...Hit .349 (15-for-43) with seven extra-base hits (6 2B, HR) in his first 10 starts...Hit safely in all 10. Was acquired from Philadelphia on July 28, just days before the 2017 non-waiver trade deadline...Hit .293 with eight doubles, two triples, seven home runs, 25 RBI, 11 walks and 24 runs scored in 52 games for the Nationals...He hit .315 with a .368 on-base percentage and a .475 slugging percentage in 91 games between the two National League East clubs...Made 39 starts for the Nation- als, appearing in left field (30 GS), right field (3 GS), second base (5 GS), and first base (1 GS) while not being charged with an error along the way...He went 5-for-14 (.357) with two doubles, two RBI, one walk and three runs scored as a pinch hitter...Made his mark with his new club right off the bat, going 10-for-21 (.476) with two doubles, a home run and two RBI in his first six games with the Nationals, including matching a career high with five hits on Aug. 1 at MIA..On Aug. 13 against SFG, he clubbed his first career grand slam and third career walk-off home run in the bottom of the 11th inning to give Washington the 6-2 win...Just days later, he hit his 100th career home run, Aug. 15 vs. LAA as a part of his seventh career multi-home run game and first since April 18, 2014 at DET. Batted .295 with 22 doubles, two triples, nine homers and 54 RBI in 117 games in his first season with the Dodgers. ... Came through in the clutch, hitting .335 with runners on base (64-for-191), batting .360 with runners in scoring position (36- for-100) and going 5-for-10 (.500) with the bases loaded…his batting average with RISP ranked as the fifth-best mark in the NL. ... Ended the season on a hot streak, despite his late-season DL stint, batting .344 (32-for-93) with five doubles, two homers and 14 RBI in 23 games from July 28-conclusion of the season…batted .289 (13-for-45) in 12 games after returning from the DL on Sept. 18. ... Hit .312 (72-for-231) in 59 home games and has a .316 career batting average (97-for-307) in 79 games at Dodger Stadium, the fourth-highest mark among active players (min. 100 AB). ... Batted .297 (105-for-354) against right-handed pitchers, the eighth-best mark by a National League right-handed hitter. ... Had two walk-off hits, April 14 vs. Seattle and June 10 vs. Arizona. ... Committed only five errors in 989.0 innings in 113 games (112 starts) at second base, good for a .990 fielding percentage. ... Was successful on six of eight stolen base attempts, as he surpassed 100-career stolen bases (101) on July 29. ... Placed on the DL from Aug. 10-Sept. 18 with a strained left hamstring. ... Started all five of the Dodgers' NLDS games vs. New York, going 6-for-22 (.273) wtih a double, a homer and four RBI. Completed eighth big league season with the Angels, batting .297 (142/478) with 21 doubles, four triples, 13 home runs and 54 RBI…13 homers were the second-highest total of his career (18 in 2011)... Finished the first half batting .310 (109/352) with 11 HR and 40 RBI…His 109 hits before the All-Star break were the most by an Angel second baseman in franchise history while his .310 clip was tied for first…Was the first ML second baseman with 105 hits and 10 HR before the break since Brandon Phillips and Robinson Cano in 2010...His .310 clip before the break ranked fourth by a ML second baseman... He and Mike Trout were the first pair of Halo teammates with at least 105 hits before the break since 2000 (D. Erstad & M. Vaughn)…Club only had at least two players with 105+ hits before the break in 2000 and 1979 (C. Lansford, D. Baylor & B. Downing)... Batted .317 (99/312) with nine home runs and 38 RBI over his first 81 games of the season but posted a .259 (43/166) mark with four home runs and 16 RBI after July 1... Logged fifth career multi-home run game on April 23 vs. Texas, including a walk-off in the 11th inning...Marked fourth career walk-off hit and first since May 30, 2010... Missed 33 games after being placed on the 15-day disabled list August 10 with a hyper-extended left knee...Returned to the lineup Sept. 11 vs. Toronto. Spent seventh season with Angels improving in nearly every offensive category over his 2011 numbers...Hit .287 (158-for-550) with 32 doubles, eight home runs, 67 RBIs and 14 stolen bases...The 32 doubles represented his second-highest single season total of his career (41 in 2010) while the 14 steals tied a career high...One of three AL second baseman in 2012 with 30+ doubles, 60+ RBIs and 10+ SBs (Ian Kinsler and Dustin Pedroia)...Is only Major League second baseman to accomplish feat in each of last three seasons (2010-12) and only Halo second baseman in club history to ever post those numbers in any single campaign...After batting .241 in April, went on to hit .296 the rest of year, which ranked second amongst AL second baseman (Robinson Cano, .320)...Ended season with 11 hits in his final 20 at-bats (.550)...Posted a 15-game hit streak from Aug. 12-29, longest streak by a Halo in 2012 and second-longest personal stretch of his career (18-game in 2011)...Connected for fifth home run of the season on July 2 and first since May 2 (50 G)...Ended second-longest homerless drought of career (longest, 68 G, Sept. 4, 2007 to July 10, 2008)...Longest single-season homerless streak of career...Fell one extra-base hit shy of cycle twice...On May 1 vs. MIN, needed a double to complete feat while finishing HR shy on April 15 at NYY. Spent sixth season with Angels and batted .285 (153/537) with 86 runs, 30 doubles, six triples, 18 home runs and63 RBI...Set career bests in several categories including runs, triples and home runs...Also tied career-high with 14stolen bases...Led Angels with 44 multi-hit games, the same number of multi-hit efforts to lead the club in 2010...Named to first career All-Star team...First Angel second baseman named to Mid-Summer Classic since Johnny Rayin 1988...Kendrick's .285 average ranked third among A.L. second basemen behind Dustin Pedroia and RobinsonCano...Committed just four errors in 482 total chances at 2B on season (.992)...992 fielding pct. led all A.L. secondbasemen and was second-best single-season fielding pct. by a Halo second baseman (Bobby Grich, .997 in 1985)...Made first ever start and appearance in outfield (LF) May 10 and started there 20 times in 2011 (0 E)...Also made 11starts at first base (1 E)...Connected for HRs in five of six games (8/21-28), the first Angel to do so since KendrysMorales (5 HR, 6 GP, Jul 27 - Aug 2, 2009)...The most recent Angel 2B to accomplished 5HR/6G feat was B. Grich (6HR in 6 GP, June 6 - Aug 15, 1981: in the interrupted season - ELIAS)...His six home runs in April set a career-highfor any month...Just 15th second baseman in the live ball era to have at least six home runs through his team'sfirst 18 games...Hit three home runs in four games of season opening series at KC...Angels top hitter over firsttwo months of season hitting at a .322 clip (57/177)...Batted .302 before the All-Star break and .263 after...Talliedtwo multi-HR games (9/13 at Oak. & 4/3 at KC)...Career best 18-game hit streak (.319; 22/69) June 20-July 9...Missed two weeks of season with a strained right hamstring (disabled May 20-June 3)...Agreed to four-year contractextension on January 9, 2012. Logged career-bests in several categories including games played(158), runs scored (67), hits (172), doubles (41), triples (4), totalbases (251), RBI (75) and stolen bases (14)...Matched career-highwith 10 home runs...Among A.L. second baseman, ranked second inhits, doubles and RBI trailing only Robinson Cano...Committed acareer-high 10 errors...His 44 multi-hit games led Angels...Batted.292 with RISP (42/144)...158 games played led club and rankedT8th in A.L...First Angels' second baseman to reach 40 doubles since Johnny Ray in 1988...Logged a career-high five hitson August 25th vs. Rays (5-for-6)...Had season-high 12-game hit streak (July 27-Aug. 10)...Angels were 16-27 when hewas hitless...Eight of his 10 home runs were hit to opposite field or centerfield...Batted leadoff in nine games during E.Aybar's absence in June - first nine times starting leadoff in his career...Recorded second career multi-HR game May 30thvs. Seattle, including first career walk-off HR (3-run in 9th)...Walk-off hit was his second of season and third of career...Laid down walk-off bunt single with two outs in 9th inn. on April 28th vs.Cleveland. Rebounded from slow start after option to Salt Lake (June 13) to return in early July...Ended up as one of top hitters inMLB over the second half of season...Ranked 2nd in AL from July 4th thru end of season batting .351 (66/188; min. of150 plate appearances) with 35 runs and 38 RBI in 54 games...Established career-highs in hits (109 - tied), runs (61),home runs (10) and RBI (61) in 105 games...Hit safely in 22 of last 27 starts batting .358 (38/106)...Raised average from.231 at time of option to .291 by season's end...Ranked 2nd in AL in July, batting .387 (24/62), trailing only teammate E.Aybar (.414)...Angels went 9-1 when he homered... Matched career-high (2nd time of 2009) with 5 RBI, Sept. 20 at Texas...Established career-high with 5 RBI July 29 vs. Indians...Only one other Angels' second baseman has driven in five-or-moreruns in a game - Adam Kennedy (8 RBI), April 18, 2000 at Toronto...In 20 games with Salt Lake, batted .346 (27/78) with6 doubles, 1 triple, 2 home runs and 11 RBI...Committed just four errors in 95 games at second base (.991). Limited to 92 games in third season with Angels due to two DL stints for a strained left hamstring (missed 65 games on DL).. Initially suffered injury April 13th at Seattle in 7th inning while rounding second base...Placed on 15-day DL April 19 (retro to April 14) and activated May 30...Left game in 4th inning August 27 with re-aggravated strain in left hamstring (returned to action Sept. 22)...Batted .366 (30/82) with RISP to lead Angels...Committed three errors first 15 games at second base - had just one error in his last 77 games at position...Batted .531 in April (17/32) and had 18 hits in his first 36 at-bats, most by an Angel to start a season since Garret Anderson was 18-for-36 to open the 2003 campaign...Logged four hits Aug. 8th vs. NYY (3rd time in 2008)...Four of his six career 4-hit games have come vs. NYY...Tied club record with three doubles July 23rd vs. Cleveland...Totaled career-best 26 doubles and 11 stolen bases...Collected first career multiple home run game July 10 at Texas...Made second Opening Day Roster, both as starting second baseman. Enjoyed solid sophomore season despite two trips to disabled list with finger injuries...Hit .322(109/338) with 55 runs scored, 24 doubles, two triples, five home runs and 39 RBI in 88 games...His 109 hits in 88 games projects to 201 for a full season...Missed a total of 67 games on DL...On DL July 14 (retro to July 9) - August 20 with a fracture in his left index finger and missed 35 games...Also missed 32 games duringhis first DL stint (April 18-May 22) with a middle finger fracture on his left hand...One of club's top performers down stretch as he hit .340 (34/100) in Sept. and .357 (51/143) after All-Star break...Batted .331 (50/151) on the road to lead Angels...Posted season-high three RBI, Aug. 31 vs. Texas, including walk-off single in 10th inning...Had season-high 12-game hit streak June 17-29...Scored winning run in 11th inningAug. 20 vs. NYY after doubling with one out in the inning...Also doubled and scored what proved to be game-winning run in 13th inning in Angels' July 7 victory at New York...Made first Opening Day roster. Kendrick served two tours with the Angels in 2006. He finished the year with a .285 average, four home runs and 30 RBIs after batting just .136 with one RBI in his first stint with the Angels. Kendrick had a 16-game hitting streak from July 26 to Aug. 6, the longest by a rookie in the American League all season. He batted .500 (20-for-40) in 10 games in July with one home run and 10 RBIs. Kendrick made his Major League debut on April 26 as the starting second baseman. He was named the Rookie of the Year in the Pacific Coast League and to Baseball America's Minor League All-Star team. Hit .369 with Triple-A Salt Lake, his fifth straight year of topping the .300 mark in the Minor Leagues. Solidified spot as one of top prospects in the Minor Leagues, hitting exactly .367 (172/469) for second straight campaignin split season with Class A Rancho Cucamonga and Double-A Arkansas (also hit .367 in Cedar Rapids in 2004 and.368 in 2003 with Provo)...367 clip ranked second in all of Minor Leagues to Rick Short's .383 mark with New Orleans...Totaled 104 runs, 43 doubles, eight triples, 19 home runs and 89 RBI and was named Angels' Minor League Co-Playerof the Year with Brandon Wood...With Rancho Cucamonga, hit .384 (107/279) with 12 HRs and 47 RBI in 63 games...Totaled three or more hits 12 times, including three 4-hit efforts and one 5-hit performance...Batted over .400 inApril (.404, 40/99) and July (.426, 26/61)...Honors with Rancho Cucamonga included: Organization Player of Month(April), California League Post-Season All-Star Team, California League All-Star Game Selection and Baseball America'sHigh Class-A All-Star team...With Arkansas, hit .342 (65/190) with seven home runs and 42 RBI in 46 games...NamedTexas League Player of Month for August after hitting .377 for the month...Posted 20-game hit streak, July 30-Aug.20...Tabbed as #1 prospect in Texas League by Baseball America...Played for Scottsdale in Arizona Fall League andled league with 46 hits and 27 runs and ranked tied for third with .380 average...Selected as one of 24 playersto represent the United States at the 2005 Olympic Qualifying Tournament in Phoenix, AZ (Nov. 15-19)...Led allplayers in tournament with 7 RBI and 3 SBs...U.S. finished 5-0 and plays in the 2006 Americas Continental OlympicQualifying Tournament in Havana, Cuba in August. Finished season with a franchise-record .367 average at Cedar Rapids and was awarded the Midwest League's batting title (although 41 plate appearances shy of the minimum necessary to qualify, it was determinedhe would still have the league's highest average if 41 at-bats were added to his totals, per Baseball Rule 10.23)...In75 contests, registered 36 multihit games...Midwest League Player of Week, May 3-9, and named to Midwest LeaguePost-Season All-Star Team and as Midwest League All-Star Game Selection. Spent season with rookie level Provo and finished third in the league with a .368 average and .434 on-basepercentage and was second in runs scored (65) and fourth in hits (86)...Started season in 4-for-40 slump beforeresponding by hitting .428 (77/180) over next two months (July-August)...Numerous accolades included: PioneerLeague Post-Season Honorable Mention, Topps Pioneer League Player of the Month for August, Organization Playerof the Month for August and Pioneer League Player of the Week, Aug. 25-31. Made professional debut with the Angels Arizona Summer League team and led squad with .318 battingaverage, which ranked ninth-best in the league. April 4, 2019 Washington Nationals activated 2B Howie Kendrick from the 10-day injured list. 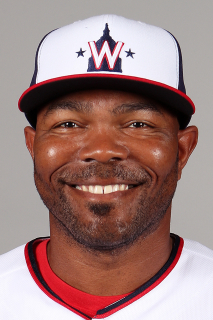 March 27, 2019 Washington Nationals placed 2B Howie Kendrick on the 10-day injured list retroactive to March 25, 2019. Left hamstring strain. October 29, 2018 Washington Nationals activated 2B Howie Kendrick from the 60-day disabled list. January 18, 2018 Washington Nationals signed free agent 2B Howie Kendrick. January 18, 2018 Washington Nationals activated 2B Howie Kendrick. November 2, 2017 LF Howie Kendrick elected free agency. July 29, 2017 Washington Nationals activated LF Howie Kendrick. July 28, 2017 Philadelphia Phillies traded LF Howie Kendrick and cash to Washington Nationals for LHP McKenzie Mills and Future Considerations. July 21, 2017 Philadelphia Phillies activated LF Howie Kendrick from the 10-day disabled list. July 20, 2017 Philadelphia Phillies sent OF Howie Kendrick on a rehab assignment to Reading Fightin Phils. May 29, 2017 Philadelphia Phillies activated LF Howie Kendrick. May 24, 2017 Philadelphia Phillies sent OF Howie Kendrick on a rehab assignment to Lehigh Valley IronPigs. April 18, 2017 Philadelphia Phillies placed LF Howie Kendrick on the 10-day disabled list retroactive to April 16, 2017. Right abdominal strain. November 11, 2016 Los Angeles Dodgers traded LF Howie Kendrick to Philadelphia Phillies for 1B Darin Ruf and Darnell Sweeney. April 12, 2016 Los Angeles Dodgers activated LF Howie Kendrick from the 15-day disabled list. April 7, 2016 Los Angeles Dodgers sent 2B Howie Kendrick on a rehab assignment to Rancho Cucamonga Quakes. February 4, 2016 Los Angeles Dodgers signed free agent 2B Howie Kendrick. November 2, 2015 2B Howie Kendrick elected free agency. September 18, 2015 Los Angeles Dodgers activated 2B Howie Kendrick from the 15-day disabled list. August 10, 2015 Los Angeles Dodgers placed 2B Howie Kendrick on the 15-day disabled list. Strained left hamstring. September 10, 2013 Los Angeles Angels activated 2B Howie Kendrick from the 15-day disabled list. August 10, 2013 Los Angeles Angels placed 2B Howie Kendrick on the 15-day disabled list retroactive to August 5, 2013. Sprained left knee. June 4, 2011 Los Angeles Angels activated 2B Howie Kendrick from the 15-day disabled list. May 26, 2011 Los Angeles Angels placed 2B Howie Kendrick on the 15-day disabled list retroactive to May 20, 2011. Right hamstring injury. July 4, 2009 Los Angeles Angels recalled 2B Howie Kendrick from Salt Lake Bees. June 13, 2009 Los Angeles Angels optioned Howie Kendrick to Salt Lake Bees.